A furnace was working on this site since 1590 and the blast furnace ceased production in about 1828. This was a charcoal blast furnace which pre dates the later coke furnaces of the Industrial age. A waterwheel was used to power bellows which created the blast into the furnace chamber and increased the heat to burn the charcoal and melt the iron. 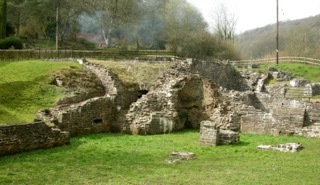 It is likely that the furnace was rebuilt on a number of occasions, giving rise to a complex sequence of phasing in the visible remains of stonework. It is noted historically (Mushet) that Angidy was the first site in Britain to use cylinders to power the blast into the furnace as opposed to the bellows used earlier. These may have been installed in the 18th century. The ironworks complex extends to a much wider area than just the scheduled area, including most of the adjacent cottage gardens. Industrial sites like this were located up and down the Angidy valley. 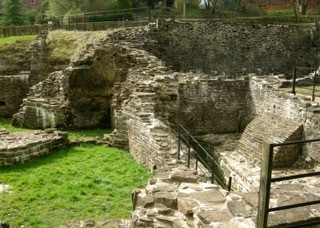 The visible structures are the remains of the charcoal store, ore house, leat and launder supports, wheel pit, blast furnace, springing for the arched front of the furnace and other ancillary structures. Of most significance to this document is the square culvert opening from the north end of the wheel pit. 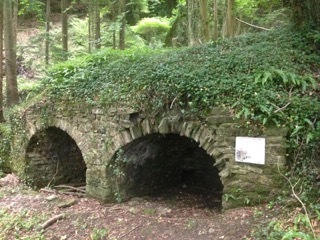 This runs underneath the site and beneath the road through land belonging to Furnace Cottage and Forestry Commission Wales, to flow into the Angidy river lower down its course. Other structures relating to the operations of the site are underneath the ground generally called the ‘casting house floor’. There are archaeological remains within 30cm of the ground surface in this area. Details regarding the archaeological remains can be found in John Pickin’s original excavation report and in Dr. Neil Phillips (APAC LTD,WB/AONB3/10) subsequent reports as watching briefs during the works achieved in 2010 as part of the Overlooking the Wye scheme. As part of the Overlooking the Wye scheme the site was conserved following many years of flooding (due to blockages in the underground culvert) and accelerated vegetation growth. Vegetation was removed from all the structural elements. Deeply rooted trees had caused a lot of structural damage to the walls. Interpretation panels were provided on the site. A leaflet was also produced describing the Angidy Trail walk (a circular route) linking the industrial remains in the Angidy Valley, including Lower Wireworks with Abbey Tintern Furnace, Tintern Limekilns, Tintern Abbey and Abbey Mill. The wheel pit was emptied to a depth of 3.5m (this is the depth to which it was excavated archaeologically in the 1980s) using a 2.5 ton excavator sitting on steel bridge plates resting on railway sleepers and sand bags to protect the masonry. A pump was used to reduce the water level to aid visibility and the fill was deposited onto the casting house floor. Building stone was removed and used for consolidation. 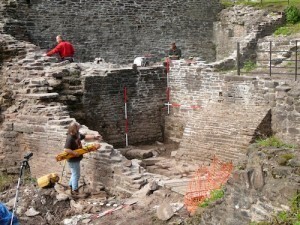 Significant amounts of stone were removed from the wheel pit that had been thrown or fallen into the pit. This had contributed significantly to the build up of material in the wheel pit and subsequently blocked the square ‘hutch’ that leads into the culvert. The culvert is underwater in the wheel pit and is quite a small opening so could become easily blocked. Water flow through the north end of the wheel pit has always been and will remain an issue. The wall was only partially repointed as the water must be able to flow through the masonry to prevent pressure build up. The water ‘leaks’ from the river so ‘rip rap’ rolls have been used along the river bank to prevent further erosion. This work was undertaken under the contractual supervision of Monmouthshire County Council but paid for by OLW. It is quite possible that the water is following an earlier archaeological channel that we do not know about. The works have reduced the flow to about 2/3 of what it was, though sand bags used throughout the contract works were more effective. See long term issues below. In the south-east corner of the casting house floor a stone slab covers an original inspection shaft. This was previously open, but a large mass of stone and debris had fallen into the shaft and blocked the culvert. This was removed by hand. A 3x3m trench using an excavator under archaeological supervision was excavated to the north of this to allow better access to the culvert which is a stone lined channel with sandstone slabs on top (cut & cover). This allowed access to the channel with jetting equipment. Jetting was partially successful however a clear connection from the wheel pit to the inspection shaft was never made. The jetter could be heard but not seen, it is possible that the culvert we unblocked at this point was an offshoot of a slightly deeper main channel but this was not proven. In the area of Furnace Cottage gardens a deep investigative channel had been dug to establish the location of the culvert in this area as part of the earlier planning phase. This was flooded. Excavation with the digger and clearance of the outflow lowered the water level and allowed us to core holes to establish where the culvert was blocked. In this area a number of stone slabs had snapped or slipped causing the culvert to block with silt and other debris. Given the nature of the material blocking the culvert much of this had accumulated historically- as it was made up of a lot of slag. The level was reduced by about 40 cm and was free flowing at completion of works. Broken slabs were replaced with new ones as like for like, and the trench backfilled. The culvert outflow is on land belonging to Forestry Commission Wales (at time of writing) and is not scheduled. The channel was dug out to a depth of about 1 metre, along with the removal of the blockages to the covered culvert in this area on land belonging to Furnace Cottages. This clearance had a significant impact on the level of water around the Furnace. The flow must be unimpeded in this area to avoid flooding of the scheduled monument in the future. The stream bed needs to be checked for branches and collapses of the sides which will cause the stream to dam and back up. This could be achieved by using AONB volunteers or local archaeological groups.